Well, it’s the beginning of the holiday season again, this year went by pretty fast! Certainly not enough time on the water for me, hopefully you had better luck. It is a good time to reflect on how fortunate we are to live on the north coast, and appreciate all of the fishing opportunities that we have. HASA will continue working to provide these fishing opportunities for ourselves and future generations. At long last, the HASA survey of members’ priorities has been summarized by Board Member Dirk Pederson on page 10, and provided some very useful information to guide HASA over the coming years. One of the things that was a bit surprising to me was the importance of Pacific halibut amongst all of the species we have available here. I (along with Tom Marking and Tim Klassen) have been very active in Pacific halibut management meetings, and I sometimes wondered if I was putting too much time and emotional effort into trying to get more Pacific halibut allocation to California that wasn’t a priority for our members. 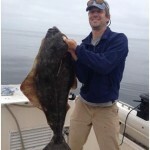 However, the survey results showed that Pacific halibut was nearly as important as salmon! This was corroborated by the large turnout of HASA members to the California Fish and Game Commission meeting last month in Eureka, where we gave the Commission an update on the current state of PFMC management. So I guess we should continue working hard on the Pacific halibut allocation issue. We were also pleased to see strong support for HASA to support kids fishing derbies, which will encourage the next generation of saltwater anglers. Lastly, there were several comments that encouraged HASA to support improvements to boating infrastructure, and we have already responded by purchasing dock improvement materials for the City of Eureka, and getting more involved in dredging needs near the Eureka boat launch. If there are other needs that you see, please let us know! As Casey mentions on page 24, Jed Douglas will unfortunately be leaving the HASA board at the end of the year, and we wanted to thank him and all prior board members for their service to our cause. Prior to joining HASA, I have never served on a Board of Directors, and like many others, was hesitant about serving. However, I have found the experience to be extremely rewarding, and have learned a tremendous amount about fishing and fisheries. If you are interested in becoming a board member, please contact a board member if you have any questions and/or would like to be nominated, then come to the HASA General Membership meeting (in late January or early February). Lastly, Casey and contributors have put together some very interesting articles in the following pages, which you should enjoy. If you would like to contribute an article to future newsletters, or have suggestions on a topic you think would be interesting to HASA members, please share with Casey. Here’s to a full crab season, be safe, and hope to see you out on the water!